A perfect meal to come home to – ten minutes preparation, leave it cooking for the day and a few minutes prep when you get in and “voila” a meal that looks like you have spent hours slaving over a hot stove !! 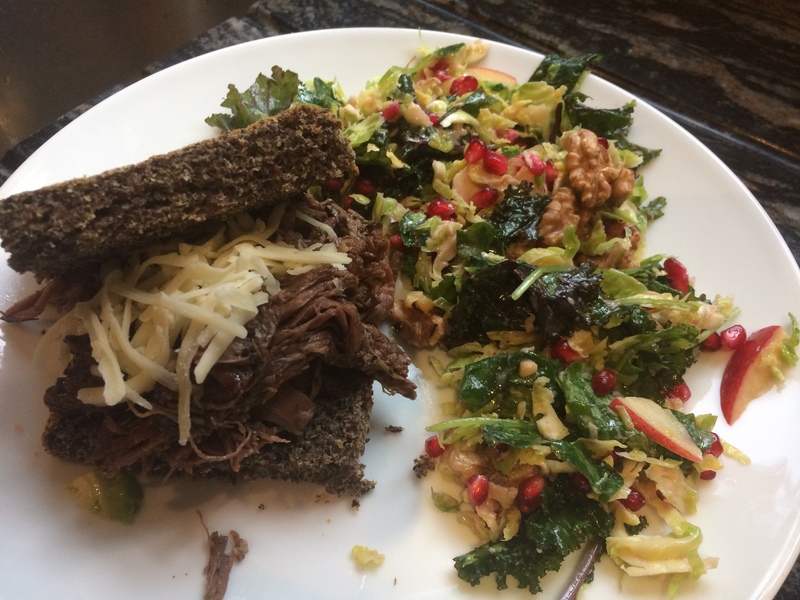 I served my Garlic and Ale Beef with my homemade Flaxseed Focaccia, toasted from the freezer, and a really tangy Kale, Brussel Sprout, Apple and Pomegranate Salad. It all went together perfectly. The beef could be served on bread rolls (if you are not gluten-free) or even to top a baked potato or baked sweet potato which is what we did with the left-overs. Another bonus of finding this recipe was that I also found a marvellous tip for making Italian Dressing quickly and easily; storing the herbs and spices in an airtight container and adding to oil and vinegar when you need the dressing. Recipe further down. Put the chuck roast into a large slow cooker. Sprinkle with the salt and pepper and lay the garlic cloves on top of the roast. 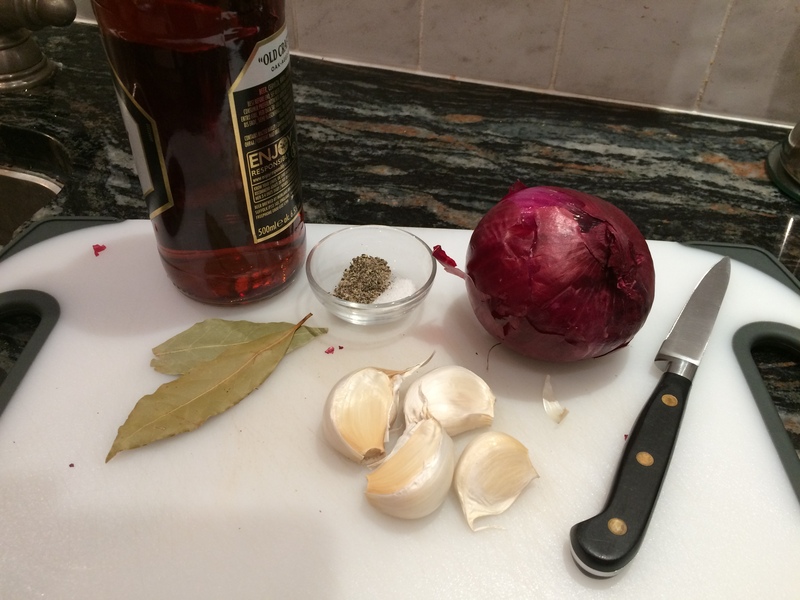 Add the red onion slices then pour over the Italian dressing and beer. Finally topping with the bay leaves. Cover and cook (without taking the lid off) for 6 hours on HIGH or for 8 to 10 hours on LOW. Discard bay leaves. Take the meat out and shred with two forks. Mash the garlic and mix in with the meat. 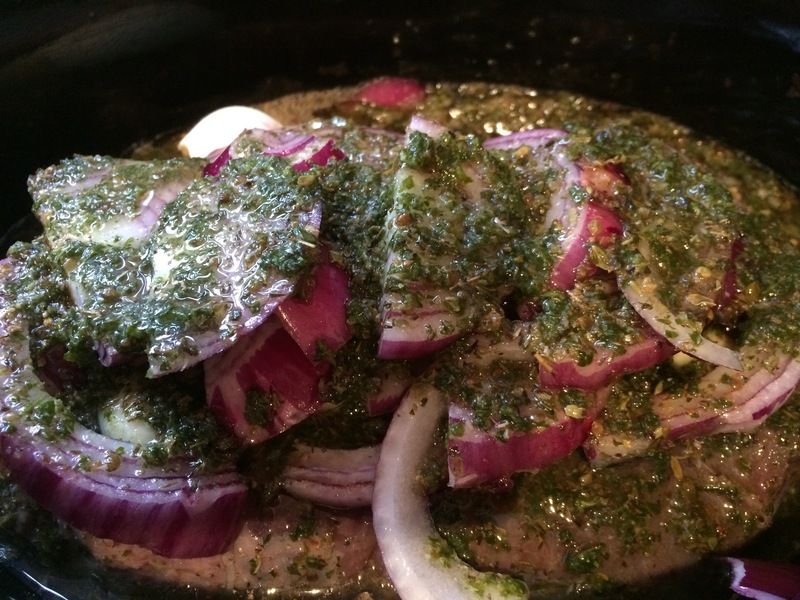 Drain off and discard any fat/oil and mix the cooking juices in with the meat. I found the oil soon rose to the top of the juice which I discarded, then I mixed about half of the juice in with the meat. Toast your buns/bread and pile high with the meat mixture. If desired, top with some sliced Colby-Jack cheese (or grated cheddar) and pop under the grill for a minute or two to melt. Serve either on their own, or with a delicious green salad. In a small bowl, mix together all the ingredients and store in a tightly sealed container. To prepare the dressing – whisk together ¼ cup white vinegar, 2/3 cup olive oil, 2 tablespoons water and 2 tablespoons of the dry mix. NB: All the photographs used in this blog have been taken by me, and are of food I have prepared and served myself. 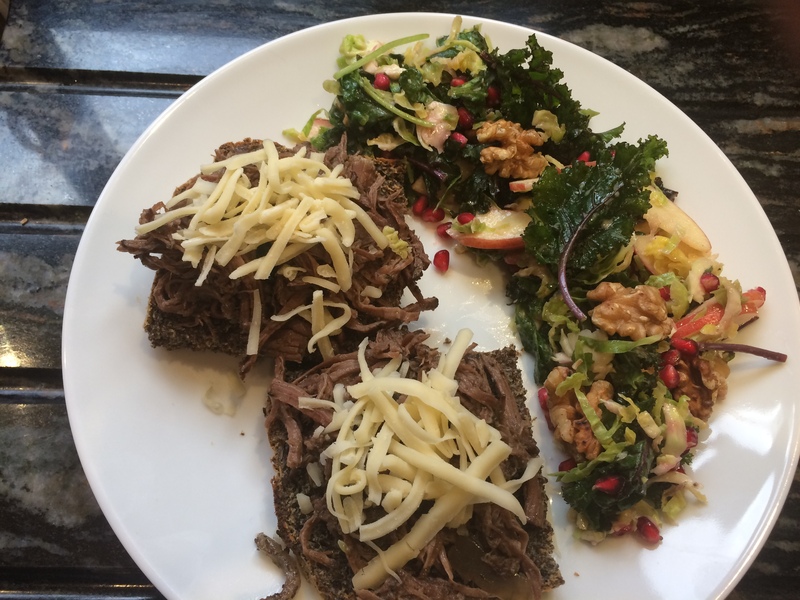 This entry was posted in Dinner, Lunch and tagged Beef, Burger, Dinner, Garlic, Gluten Free, Healthy Eating, Lunch, Supper, Wheat-Free. Bookmark the permalink. I’m hungry just reading it. I so want to make this.